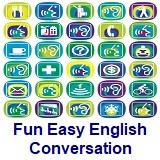 ﻿ Fun Easy English - new classroom free online classes english language lessons speaking listening writing reading june 21. Today in the classroom you are going to learn some words you should know beginning with the letter J. The words on this page came from the VOA, Voice of America, Special English Word Book. 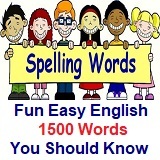 Use the Fun Easy English dictionary for a more detailed explanation of each word. 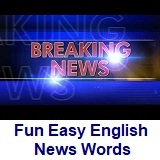 Fun Easy English Words You Should Know comes from the VOA, Voice of America, Special English Word Book Vocabulary. Special English, now called Learning English, consists of 1,500 essential words which anyone learning English should know. The videos on this page came from the VOA, Voice of America, News Words program. 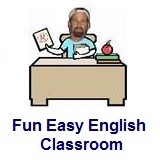 Use the Fun Easy English dictionary for a detailed explanation of words you do not understand. Click the full screen button on the video to make it easier to watch and to read the video script. The following classroom lessons are great for students who want additional conversation, listening, and reading practice. Please post a comment at the bottom of this page in the Facebook Comments window with your thoughts about these lessons. Conversation Lesson - Advanced Level. Dialogs for everyday use. 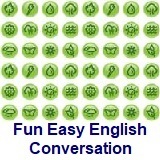 Short situational dialogs for students of English as a Foreign (EFL) or Second (ESL) Language with a written conversation and a conversation notes section. Dialogs for everyday use. Short situational dialogs for students of English as a Foreign (EFL) or Second (ESL) Language. SHANNON: What a fantastic performance! Thank you for inviting me to the musical. ELENA: You are welcome. I’m happy you enjoyed the show. The choreography of the dancers was incredible. It reminds me of when I used to dance. SHANNON: I know! You were such a talented ballerina. Do you miss dancing? ELENA: Oh, that’s very kind of you, Shannon. I do miss it sometimes. But I will always be a fan of the arts. That’s why I love going to musicals because it’s the perfect combination of song, dance and theater. SHANNON: Absolutely! I’m glad you are still an art fan too. Thank you for the invitation. It’s always a pleasure to attend an arts event with you and learn something new. When getting a compliment to someone (for example: “You were such a talented ballerina”), you can either accept the compliment (“That’s very kind of you”) or downplay the compliment (“Oh, I wasn’t that good”). Giving compliments in English often includes using superlatives (“the most …,” “the best …”). This is the best musical playing on Broadway! / What’s the most entertaining movie you’ve seen? However, compliments can also be given by using the construction “I’m a fan of …”: I’m a fan of the arts. / I’m a big fan of theater. / I’m a huge fan of this band. Notice the use of adjectives. 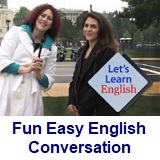 This is a collection of 36 situational conversations which focus on spoken American English in a relatively natural way....these lessons are for intermediate students. 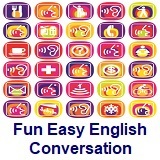 English conversation lessons. 30 lessons focusing mostly on communication and grammar topics....these lessons are for intermediate students.